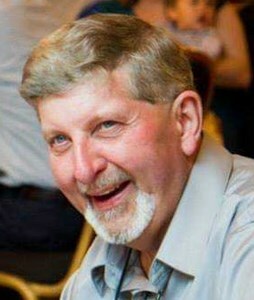 David L. Johnson, 64, of Howard, departed this life on Thursday, February 7, 2019 at Bellin Health Hospital surrounded by his family. Dave was born on February 24, 1954 in Green Bay, son of the late Roger and Carol (Mott) Johnson. He was a graduate of Bay Port High School class of 1972. He owned and operated Manhattan Lanes in De Pere for 14 years. In his spare time he was an avid hunter and bowler. Dave had a great sense of humor and loved spending time with his family; especially his grandchildren. He will be remembered as a loyal companion and loving father. He is survived by his loving companion, Conni Stiles, and two children: Christopher Johnson and Lisa (Jeff) Timm; three step-children: Eric (Tammy) Stiles, Tony Stiles, and Marlo (Chad) Morrow. He also leaves his grandchildren: Cody Morrow, Mitch Morrow, Trevor Smith, Cameron Way, Tiffany Stiles, Erica Stiles, Ronin Timm, and Avelene Timm. Dave leaves five siblings: Steve Johnson, Tom (Connie Miller) Johnson, Larry Johnson, Ruth Holloway, and Mike (Nonie) Johnson along with numerous nieces, nephews, extended family and friends. Visitation will be held on Monday, February 11th from 4 PM - 7 PM at Newcomer - Green Bay Chapel, 340 S. Monroe Avenue, Green Bay. A service celebrating Dave's life will follow at 7 PM. Burial will be private. Dave's family wishes to thank the ICU staff at Bellin Health Hospital for the care given to him during his stay. Add your memories to the guest book of David Johnson. Dave was such a nice guy in school. Steve and family I’m so sorry for your loss. May he rest in peace and leave you with so many wonderful memories. Always enjoyed talking with Dave every time we would meet. Our condolences to all of the family. I have and will always keep the memories from deer camp. He was there when I shot my first buck, he was a good man!! My thoughts and prayers for Dave’s family and friends. Dave’s humor was one thing I’ll always remember. He made people laugh! His dreams of owning a bowling alley were fulfilled. Looking at the picture, I can hear his laugh. Dave will be missed by many.